Eddie Cantor was born Isidore Iskowitz in New York City, in 1892, the son of Russian-Jewish immigrants His mother died one year after his birth, and his father died of pneumonia when Eddie Cantor was two years old, leaving him to be raised by his grandmother, Esther Kantrowitz. Eddie inherited his grandmother�s last name, which was shortened to Kantor by a clerk at a summer camp he attended as a young boy, before finally taking on the professional name of Eddie Cantor in 1917 when he joined the Ziegfeld Follies. Eddie Cantor is just one of hundreds of American Jews who are represented in photos, audio presentations, and interactive exhibits at the National Museum of American Jewish History (www.nmajh.org), which opened during Thanksgiving weekend, 2010, in the new James Polshek-designed building in center city Philadelphia. 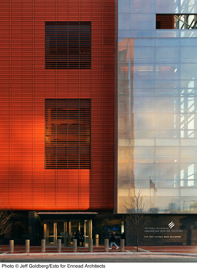 The $150 million dollar, 100,000 square foot, Lyn and George Ross Building of the National Museum of American Jewish History, is certainly spectacular, with its glass exterior, four floors of exhibition space, and views of the Liberty Bell Center, the National Constitution Center, and Independence Hall from the creatively designed exterior terraces. The permanent exhibition of Jewish history in America, from 1654 to the present, is comprehensive and informative for everyone, whatever their religious, racial, or ethnic background. The museum has been in Philadelphia since 1976, housed in a small synagogue across the street, but with only 15,000 square feet, it was time to expand," said Michael Rosensweig, President and CEO of the museum. "We have the ability in this new space to have all kinds of exhibitions, to make use of state-of-the-art technology, to hold seminars and workshops, and create a very different type of institution than we had before. We're still a Jewish institution, but not a religious institution." The core exhibition evokes the diversity of the American Jewish experience through exploring the religious, cultural, political and economic stories of American Jews. Many, like Eddie Cantor, Albert Einstein, Ellie Wiesel, Barbra Streisand, Sandy Koufax, and Leonard Bernstein are famous, but most Jews depicted in the exhibitions are not household names. Visitors can spend time on the fourth floor, learning about early Jewish settlers in colonial America, or Jewish participation in the Civil War, or on the second floor, with exhibits that depict the period from the end of World War II to the present day. "There are many time periods in American Jewish history represented here, but it was personally very fulfilling to me, as an academic specializing in Jewish life during the interwar years [1920-1940]) to set up the artifacts and collect material that relates to Jewish history between the two world wars," said Josh Perelman, the museum�s chief curator, as he surveyed an opening day crowd as they spent time reading and listening to the interactive displays that Mr. Perelman had constructed. The exhibits throughout the museum deal with a variety of Jewish, and, thus, American themes, including immigration, civil rights, anti-Semitism, the Catskills and Broadway, the Holocaust, Jewish literature, science, comedy and cuisine. 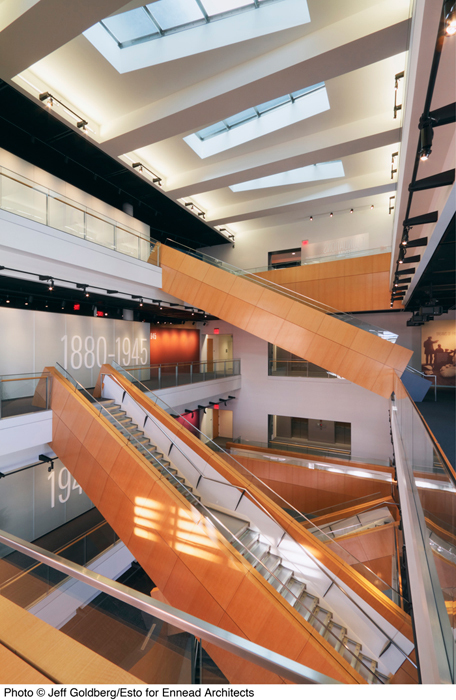 The interior of the new has contrasting images of translucent glass and opaque terra cotta with an 85-foot light filled atrium connecting the ground floor to the exhibition spaces above. 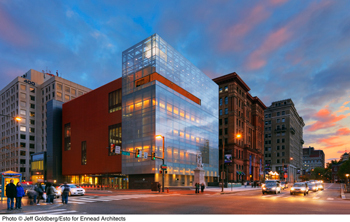 "The lot we had to work with is on a busy center city corner, facing Independence Mall on one side, with an entrance on busy 5th and Market Streets, and a sloping landscape on another side. We really had to come up with an innovative design, and the beautiful terra cotta and glass box we built really fits into the entire streetscape," said lead designer James Polshek, of Ennead Architects, during the museum's pre-opening gala event, where after-dinner entertainers included Jerry Seinfeld and Bette Midler. For many Jewish visitors, the museum will present few stories or facts that they haven't heard or seen before, but standing within a gorgeous museum gallery, watching Adam Sandler singing "The Hanukkah Song," or listening to Eddie Cantor croon "If you knew Susie" will certainly put a smile on everyone's face. For non-Jewish visitors, and the museum hopes there are many, it will be an opportunity to learn more about American Jewish history, from the arrival of two ships in New York harbor in 1624, that carried the first permanent Jewish settlers to North America, to the Jews of the Revolutionary War, to the sensational spy trial of Ethel and Julius Rosenberg. Two public sculptures at the site symbolize freedom, the core theme of the museum. 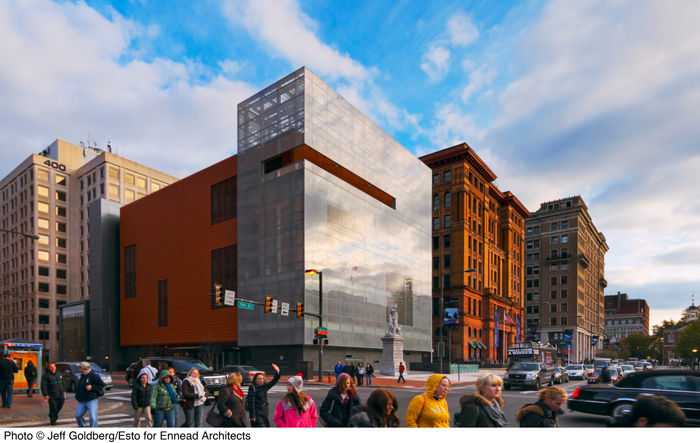 A large LED sculpture, called "Beacon," is located in the uppermost corner of the glass fa�ade at the corner of 5th and Market streets. 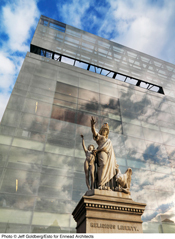 As a beacon, glowing from the top of the museum's glass envelope fa�ade, it not only encourages visitors to enter the museum, but its undulating forms will be visible from blocks away, as well as from the fifth floor terrace, where its fluid panels appear as pages in a book, inspired by the Talmud, one of the central texts of Judaism. The other sculpture, a 19th �century, 25-foot classical marble work by Sir Moses Jacob Ezekiel, the first American Jewish sculptor to gain international prominence, was donated to the city of Philadelphia in 1876. It is called "Religious Liberty," and is perhaps the most iconic symbol for a museum that sits in the middle of the city that was founded on the principle of religious freedom for all.